Kent and I are trying to get ready for our very first Free Seminars that will be hosted by the Wild Birds Unlimited stores. He and I will be running from store to store in order to make the circuit Saturday and Sunday. I did not think to have people RSVP, so we have no idea how many people are likely to show up - that should be interesting. I do wish that the weather were going to cooperate with us, but... am not holding my breath. 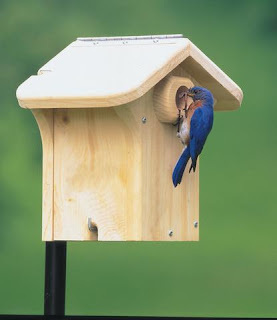 The Goodlettsville store already has a completed nest, with the Bluebirds feasting on the mealworms and No Mess Blend. I will hold out hope that the Bluebirds will make an appearance tomorrow.